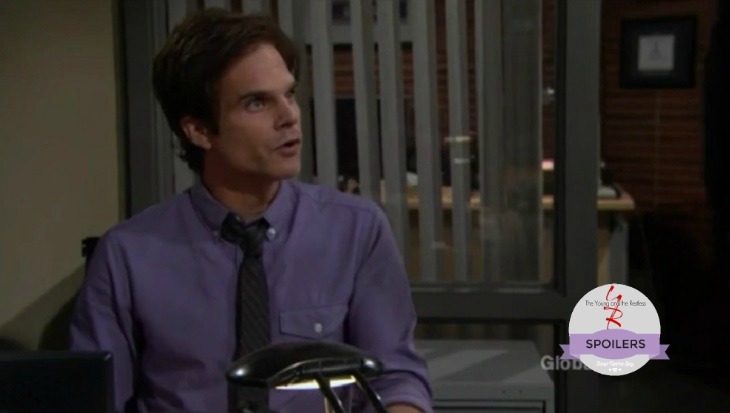 “The Young and the Restless” spoilers for Wednesday, August 17, say Kevin (Greg Rikaart) will consider the benefits of a continued investigation into Adam’s (Justin Hartley) case. He’ll share his opinion with Paul (Doug Davidson) in hopes of persuading him to dig deeper. Kevin will suggest this isn’t just about clearing Adam. He’ll believe it could prove Chloe (Elizabeth Hendrickson) is innocent, too. Kevin wants to get back together with Chloe and the last thing he needs is another potential obstacle. Perhaps Kevin thinks a reunion would be easier without this cloud of suspicion hanging over Chloe. Deep down, Kevin might even have some doubts about Chloe’s innocence. If they can point the finger at someone else, maybe it would offer Kevin some peace of mind. Then again, Kevin may have truly convinced himself that Chloe is the perfect angel. He might choose to ignore any evidence that comes to light. Of course, Chloe will be hoping that Victor (Eric Braeden) comes through for her. He promised to cover their tracks. Chloe will just have to trust Victor and that puts her in a very perilous position. Stay tuned to “The Young and the Restless” to see how all of this turns out for Chloe. Meanwhile, Mariah (Camryn Grimes) will wonder what’s going on with Dylan (Steve Burton) and Sharon (Sharon Case). Wednesday’s preview video shows Mariah saying, “You don’t just sleep on the couch because you and your wife had a disagreement.” Mariah will do her best to get to the bottom of the situation. Elsewhere, Jack (Peter Bergman) will have a tense chat with Phyllis (Gina Tognoni). He’ll ask Phyllis to do him a favor and stop lying. It sounds like Summer (Hunter King) probably blabbed. She recently realized Phyllis, Victor and Nick (Joshua Morrow) were all trying to take down Luca (Miles Gaston Villanueva). If Summer spilled the news to Jack, it’s easy to see why he’s angry. Phyllis assured Jack that she would back off and let Summer make her own mistakes. Jack will undoubtedly feel like Phyllis just told him what he wanted to hear. They can’t repair their marriage without honesty. Unfortunately, Phyllis is keeping an even bigger secret. Y&R rumors hint that Phyllis and Billy’s (Jason Thompson) affair will blow up pretty soon. Stick with the CBS soap for updates on how and when the reveal will go down.